Rocky IV 30th Anniversary Screening in 35mm! Grindhouse Dublin, in association with Light House Cinema, are thrilled to announce this months screening, a 30th Anniversary screening of the Stallone 80’s phenomenon ‘Rocky IV’ in glorious 35mm! Needing no introduction to fans of 80’s action cinema, this Mount Everest of a movie is loaded with more memorable lines than most 80’s action films put together (“I must break you!”, “if he dies, he dies!” or “Whatever he hits, he destroys” amongst others) all done to the tune of a knockout soundtrack (‘Eye of the Tiger’, ‘No Easy Way Out’ and ‘Hearts on Fire’!) kicking in at a brisk and lean 85 minutes! Not to be missed and presented in 35mm! After the death of his friend at the hands of Russian Soviet boxer Ivan Drago (Dolph Lundgren, Rocky Balboa (Sylvester Stallone) must return to the boxing ring in order to restore honour to his fallen friend. But this is no ordinary bout. Both unsanctioned and for 15 rounds, Rocky must face the ultimate challenge against his near invincible opponent in the heart of the lions den, Moscow! Get ready for the next world war! 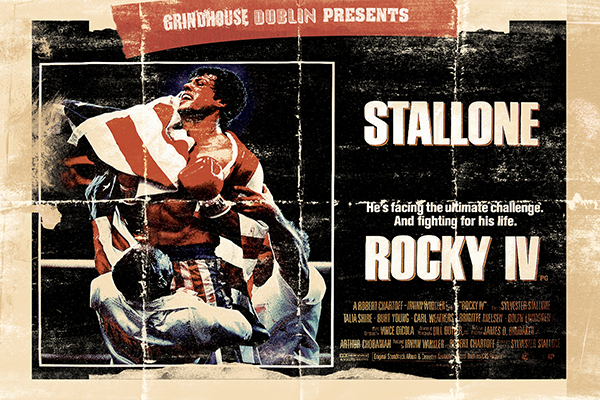 Rocky IV will be shown at Light House Cinema, Smithfield on Friday 25th November at 10:30pm!